My teenage babysitter told me about a time when she and her friends wondered how many colors of M&Ms they got in each pack. They opened several packs, counted, and started graphing. Then one of them said, "Wait a minute--why are we doing this? It's just like school!" 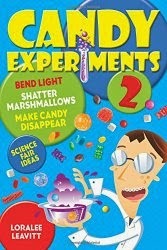 Candy experiments make learning fun because they ARE fun!